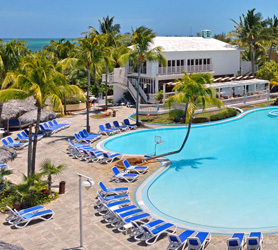 Hotel Sol Cayo Coco is an All-Inclusive 4 star Resort with 270 sumptuous rooms. Located on Cuba’s pristine Cayo Coco Island, directly on the water it provides unparalleled access to the beach and seafront, with access to two different virgin beaches. The hotel Sol Cayo Coco is encircled by natural gardens and royal palm trees. Hotel Sol is particularly recommended for family holidays, sailing, fishing, and diving with numerous other activities available free to guests. Our booking process is unique because it shows the best rate from all of these for Sol hotel in Cayo Coco and the types of rooms available. Our Sol Cayo Coco rate comparison is an industry first for Cuban Hotels.